"Who are you to impose your morality on others?" "What right do you have to convert others to your views?" "It doesn't matter what you believe--as long as you're sincere." "You can't trust the Gospels--they're unreliable." These comments don't have to be conversation stoppers. 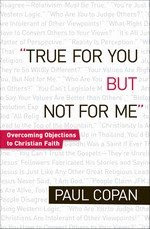 Paul Copan offers you clear, concise, and thoughtful answers to these critical remarks in this revised and expanded edition of "True for You, But Not for Me." He shows you how with "patience, practice, prayer, and God's grace," you can gently respond in ways that move into more meaningful conversations with those who object to your faith. I had high hopes for this book. I wanted it to provide me with some solid comebacks to these statements. And in part it did. It does site some scripture that is very helpful. But, it was somewhat hard to follow. I felt that the author spent more time trying to say that what he believes is right and everyone else is wrong, period. I would have liked some more logic . Anything other than the "I said so" attitude that is what came across. I thought as Christians we were supposed to witness and share the joy we've found in our Savior. This book gives the impression that condemning others is appropriate and that I do not agree with at all. Nevertheless, it was a fascinating look at one man's beliefs. As I said, it did have solid scripture references. Overall, it did not leave me with the best feeling, but then the book does point out that we are all different. You might want to pick up a copy and check it out for yourself.